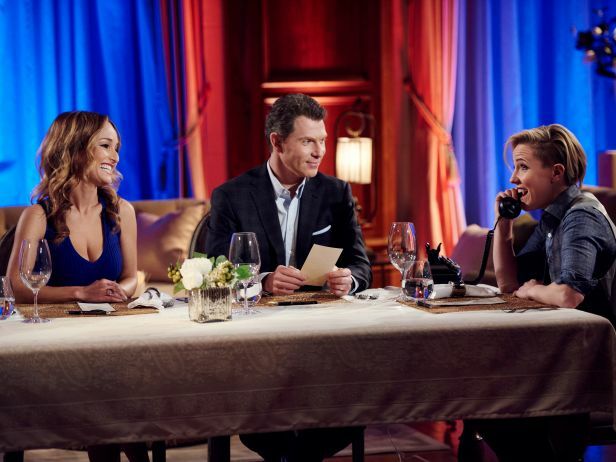 On tonight's episode of Food Network Star the remaining contestants had to deliver a trendy remote food report for Entertainment Tonight hosts Nancy O'Dell and Kevin Frazier. In the next challenge, the finalists had to prepare a special tableside dining experience at an upscale hotel restaurant. They are also tested how well they can handle curveballs thrown at them by Hannah Hart and Modern Family's Jessie Tyler Ferguson. There were three teams of three and the judges decided that there was no winning team. The bottom three were Jernard Wells, Yaku Moton-Spruill , and Rob Burmeister. The judges decided t eliminate Yaku Moton-Spruill due to his lobster being pretty much raw. On Star Salvation, Eddie Jackson and Alex Guarnaschelli were judging the eliminated contestants Yaku Moton-Spruill, Aaron Crumbaugh, and Havrid Usry to see who would have a chance to rejoin the competition. For some reason Melissa Pfeister and Martita Jara were not competing on Star Salvation. The first episode of Star Salvation can be watched here, and the contestant eliminated was Havrid Usry. So Melissa, Martita and Havrid will not be rejoining the competition and will not be the next Food Network Star.